Looking for Dedication, Leadership, Teamwork, Reliability? Hire a Veteran. America spent November 11th honoring our veterans with much deserved parades, concerts and speeches. There are simply not enough words to show our gratitude for the sacrifices these brave men and women have made for our country. Yet, many returning home after long and dangerous tours of duty are struggling to find jobs and to make ends meet. The unemployment rate for veterans is 37% higher than the rate for the country as a whole. This means that after the parades are over, many of our veterans will be turning their attention back to a frustrating job search. This high unemployment rate does not necessarily reflect an unwillingness of employers to hire veterans. Instead, it may indicate a problem connecting job-seeking service men and women with companies looking to hire. Many people join the armed forces right out of high school or college, negating the need to prepare for a job search, write resumes and complete applications. It can be difficult to try to translate military jobs and experience into terms employers understand. Plus, some recruiters have misconceptions about the kind of skills veterans will have. They might imagine all service is combat, when in fact the military trains clerks, reporters, administrators, technicians, mechanics… the list is endless. Most positions that exist in the civilian world exist in the military. Organizations like Hire Heroes USA are helping veterans with the daunting task of communicating their service experience in terms civilian employers understand. As the problem of veteran unemployment is becoming more widely known, some U.S. companies are stepping up their veteran recruitment efforts. Starbucks and AT&T have committed to hiring 10,000 veterans and military spouses over the next five years. Walmart has pledged to hire 100,000 veterans over the next five years. Pepsico has shown an ongoing commitment to hiring vets; of Fortune 50 companies, it has the highest percentage of veterans recruited from applicants received. Why seek out and hire veterans? Because they make great employees! Are dedicated, adaptable and dependable. Are extensively trained, well-rounded and able to think on their feet. Can take the lead but know the value of team work. Respect authority and follow procedures and safety protocol. Not to mention, they are heroes. Make your company military friendly...post on military jobs boards such as Military.com, HireVetsFirst.gov, TurboTap.org, HelmetstoHardhats.org and USAJobs.gov. There’s a bonus to this – many of these sites will let you post your job for free. Learn how to translate military skills to your industry. Many websites have skilled translators to help you spot what you are looking for among your veteran applicants...check out these: www.taonline.com, www.military.com. Network: Ask friends, family and existing employees if they know any former military personnel looking for jobs. 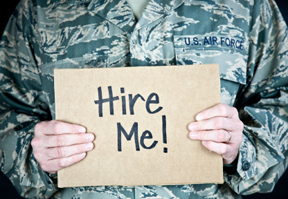 Have your recruiter keep an eye out for military service on resumes, and give these candidates a closer look. Remember, the experience they list might look different from your job positing, but if you look closer, you can easily find parallels. Also, veterans are used to learning new skills quickly and adapting.